Hello Walkers! 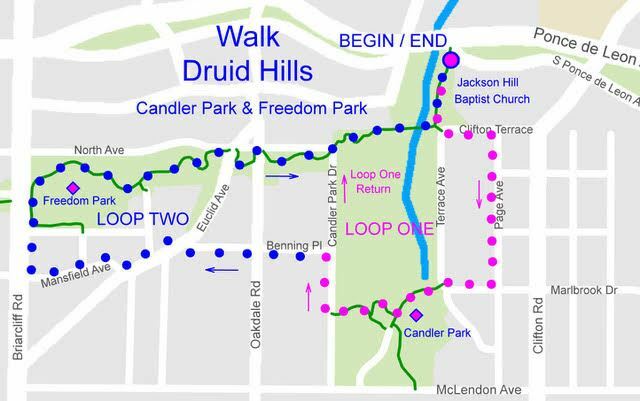 This month we will enjoy a field trip of sorts as we venture from Druid Hills to Candler Park and Freedom Park. We will begin in Druid Hills at Jackson Hill Baptist Church at 9:00 AM on Saturday, October 14. Parking is available in front of the church along South Ponce de Leon Ave. The walk is approximately three miles and includes some uneven sidewalks. October is "Walk-tober" and we are partnering with PEDS to offer a second walk later this month. More details to follow soon!